5:15 That one could have used a lightly tinted background, so one could see the pieces. So this is what happens when Civics is not taught in public schools by people who know what they are talking about. Trae and his two stand-up partners have an album coming out. I have groceries coming too. What a coincidence. Lawrence - He makes it sound as though the challenge causes the loss. I think that's a "post hoc ergo propter hoc" fallacy. I think it's the weakness of the incumbent which invites the challenge. I don't think the challenger is the cause of the loss, but rather an indicator of the weakness which already exists. Not that it necessarily matters. This development DOES make it even more important than it already was for Democrats to remain courteous to each other, and to line up behind the eventual nominee. And, incidentally, to VOTE THE FULL TICKET. Dollemore - Traitor Tot will just say that they lied, and his base will believe him. I'm sure there will be retaliation, t=but there would have been retaliation pretty well no matter what they said. "Everything Trump touches dies." Which means you are correct that they should never have been anywhere near him. DK - What Jen is pointing out a rare occasion on which Orange Judas told the truth. Other politicians, including Republicans, would have expressed phony remorse and cried crocodile tears. Instead, we have the spectacle of a pathological liar telling the truth for once. It's disorienting - or would be in normal times. Now it's just Wednesday. Cartoon - I think all the non-idiot candidates are just in hiding so Traitor Tot won't find them and promote them. MSNBC: Amen! I hope that this candidate provokes the wrath of dt so bad, that Mr. Weld wins the nomination, by standing up to him, and people seeing through dt's facade. Dollemore: They knew that realization going in to work there. I hope that they told the truth, for their sanity. if not, the life raft they're on, is gonna implode, and incur dt's wrath, for not lying. DK: ugh! Sick. A very sick man. He incites violence, and approves his message. Happy Birthday, Lynn! Enjoy! and have a great day! Hi, Wendy, hope you're doing well. Hope that you have a good rest of your day, take good care, and Thanks, Tom. *Do you remember? when I posted the quote about Michelle Obama's comment about 'divorced dads'? Well, there's a video out from divorced dads speaking out about her comment... oops! ....and many many many more!!!!! MSNBC: At minute 9:11, O'Donnell asks one of the dumbest questions I've ever heard in politics: "Is it your strategy to try to land one of those Gene McCarthy and or Pat Buchanan blows ...?" "What makes you ask that silly question? No, I'm going to just go to N.H. and play around, have some baby kissing events, eat some local food, and get drunk!" It's like the sportscasters idiot question to the team manager: "So, what's your strategy?" "Oh, we're just going to lay low until ten minutes from the end of the game, lull them into complacency, and then ramp it up to surprise them. What the hell do you think we're going to do? We're going to play at our utmost from the get-go! Duh!" He's "already in 2nd place!" I love it! Yes, conservative fiscal policy is often only a cover for enriching the rich, was before St. Reagan came along. Dollemore: I like this guy! "...expectation on the part of" POTUS, "that they lie...." Well of course, that's how he's lived his life, and that's what mob Don's expect from their underlings! 9,451 lies by day 800? What 451, and no fire in his pants? "Hellscape," is so perfect! DK: Kind of like an Al Capone? "Hey, I didn't put that tommy gun in his hands, did I?" Major POS!! You cannot tar all Muslims with the same brush - in fact, you cannot tar any one religious group with the same brush. I must plead guilty to the charge of making sweeping generalizations, but I at least am aware of this, and try to avoid making them. If we can judge all Muslims on the basis of Al Qaeda or Da'esh, can we then judge all Christians on the basis of the KKK? 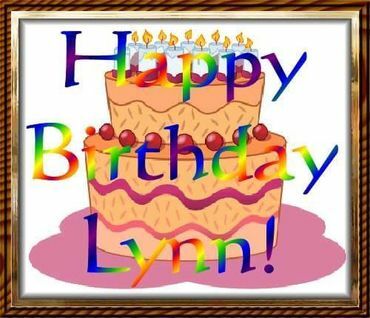 Happy Birthday Lynn! Hope your day was great. With many more to come. MSNBC: Hope tRump does meet a challenger that will knock him down. We don't want another term with him. Dollemore Knowing that they were going to be sworn in under oath, I would think they'd be honest. But seeing how tRump has somehow trained or hypnotize them so well, who knows?? They have to live with themselves. MSNBC: Strange to hear a fiscal conservative make SOME sense where Drumpf is concerned and then root for a Republican, but I’ll do that for Weld. For a while, that is. Long enough to have damaged Drumpf so much that the Republican party will eat itself and will be obliterated in 2020. Let’s hope Lawrence is right and Drumpf will lose the election like all incumbent presidents who have been challenged for their party’s nomination. But it is still up to the Democrats to nominate a candidate who will be a capable president, unite all Democrats and bring America back in the realm of democracy. Dolemore: Those White House staff members will have nothing to worry about, not for a while at least. Because if they told the truth and are afraid of being found out, it would mean that the Drumpf clan had a lot to hide, some of it perhaps even incriminating. But Barrf will have made sure that all that is redacted out, right? So no worries, yet. DK: It’s unsettling to see that only the left is resisting the, sadly successful, hatemongering against one of their own. The fact that this is done by the president of the United States of America, out on a personal vendetta, for f’s sake, doesn’t even raise eyebrow any more. In two years time it apparently has become normal and accepted for presidents to do so. Puzzle — 6:29 My time sounds like our probable gas price very shortly — $2 per litre! Good thing I don’t drive unless I have to! MSNBC — “May this challenger, as bad as his fiscal policies are, weaken Trump so much that his landslide defeat spells the end of the Republican Reich.” — AMEN!!! From your keyboard to God’s ear! Dollemore — “the Crisco Creeper” being Don Jr — LMAO!!! I could not agree more. Trump’s only concern is for himself, his thin skinned self. He has no loyalty to anyone else so if his staffers told the truth because they did not want to go to jail, they are right to fear his wrath! He shows almost daily to the outside world just how vindictive and rude he is. If I were one of Trump’s staffers (like that would ever happen— NOT! ), I would have started looking for another job awhile ago and just plain left. Daily Kos — The Dark Lord incites violence with his tweets, his rallies, with everything. He is a sociopath, a psychopath and a liar . . . a POS that has no business residing in the WH. He must go in 2020! Cartoon — Republican = Idiot!!! Thanks all for the Bday wishes. I spent a quiet day at home with the kids and doing laundry.